MCBs provide overcurrent and short-circuit protection only and are unable to detect residual current (earth leakage current) unless it is large enough to be classed as an overload or short circuit. In many applications therefore, RCBOs are a better option, but MCBs are still the most widely used devices not least in older installations. Also, there are some instances where it may be preferable to use an MCB in conjunction with a separate RCCB rather than an RCBO, as the use of separate devices can give a wider choice of protection characteristics. In those cases where MCBs have been selected as the most appropriate protection device, the next step is to decide on the type of MCB to use. BS EN 60898 defines several types of MCB according to their operating characteristic. The most common MCB characteristics are Types B, C and D, which cover the majority of commonly encountered applications. These have more recently been joined by Type K characteristics which offer improved protection in certain applications. 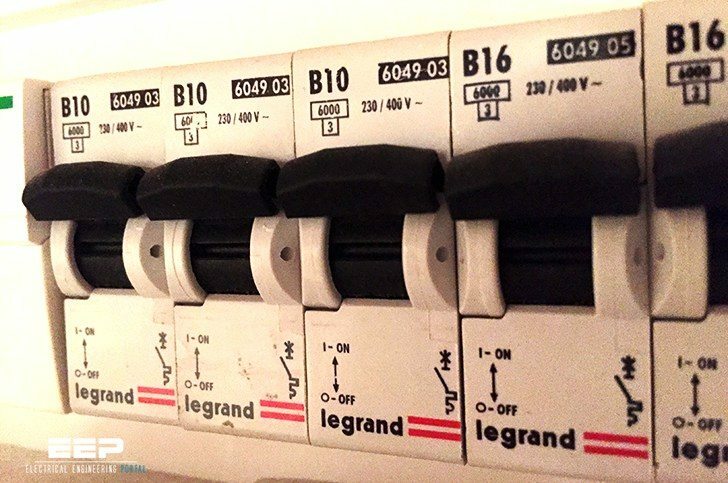 In consumer unit applications it is rare to see anything other than Type B MCBs used, with the occasional use of Type C devices on high inrush circuits such as some lighting loads. Type B MCBs react quickly to overloads, and are built to trip when the current passing through them is between 3 and 4.5 times the normal full load current. They are suitable for protecting incandescent lighting and socket-outlet circuits in domestic and commercial environments, where there is little risk of current surges of a magnitude that could cause the MCB to trip. Type C MCBs react more slowly, and are recommended for applications involving inductive loads with high inrush currents, such as fluorescent lighting installations. Type C MCBs are built to trip at between 5 and 10 times the normal full load current. 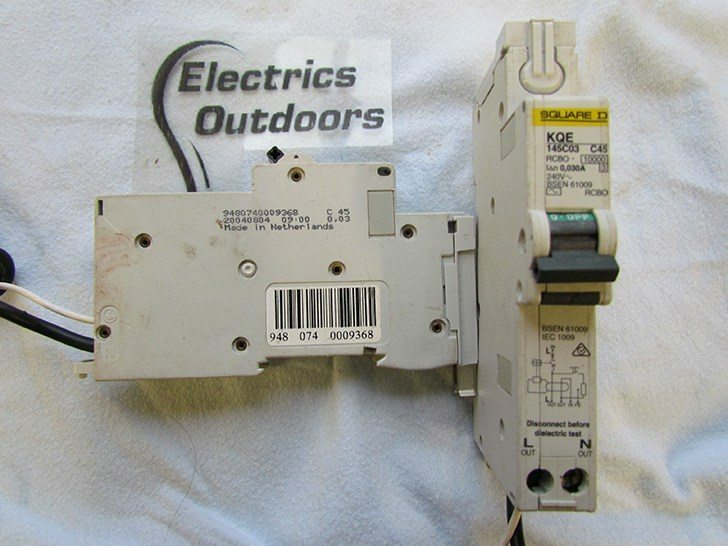 Type D MCBs are slower still, and are set to trip at between 10 and 20 times normal full load current. They are recommended only for circuits with very high inrush currents, such as those feeding transformers and welding machines. Note, however, that MCBs with Type K characteristics may provide better protection in some applications of this type. Type C and Type D breakers. In most cases, they allow improved cable protection to be provided in circuits that include motors, capacitors and transformers, where it would previously have been necessary to use Type D devices. This enhanced protection is achieved without increasing the risk of nuisance tripping. When selecting MCBs, it is essential to remember that their primary function is to quickly disconnect a fault current to protect cables and equipment downstream of the device as well as to protect personnel from electric shock. This means that devices must be chosen with ratings appropriate to the application and size of cables in use. Detailed guidance on how to do this is given in the IET Wiring Regulations. Note also that Type B and Type C MCBs can normally be selected to provide tripping times that will give adequate cable protection, but this can be more difficult with Type D and, in some cases, with Type K devices, where a lower loop impedance (Zs) may be needed to achieve the tripping time prescribed in the Wiring Regulations. A further essential feature of MCBs that must be considered is breaking capacity. This must always be greater than the prospective short-circuit current (PSCC) at the point where the MCB is to be installed, or there is a risk that the device will be unable to clear faults safely. In practice, it’s not usually difficult to satisfy this requirement, as part of the routine testing of electrical installations, which is required by the IET Wiring Regulations, involves measuring the source impedance of the supply, from which the PSCC can be calculated. In fact, many types of installation test set perform this calculation automatically. MCBs with a breaking capacity of 6 kA are very widely used and are usually chosen for domestic applications. Devices with breaking capacities of 10 kA and even 25 kA are normally used in commercial and industrial applications due to the inevitable higher fault levels associated with these installations. Intended principally to minimise the risk of injury from electric shock, RCCBs provide protection against residual (earth leakage) currents only, and are not sensitive to overloads or short circuits. For this reason, they must never be used as the sole protection device for a circuit. Circuits with RCCB protection must always include separate protection against overloads and short circuits. This is most often an MCB, but it could, for example, be a fuse. Like MCBs, RCCBs are available in various different types that are designated by letters. This is a potential source of confusion so it’s worth remembering that a Type B MCB, for example, is not related to a Type B RCCB. Type AC RCCBs are sensitive to AC currents and are suitable for most domestic and commercial applications. Type A RCCBs provide additional protection compared with Type AC devices, as they are sensitive not only to ac currents but also to pulsating DC currents. Type A devices should be used in preference to Type AC in applications where there are a lot of “electronic” loads, such as computer equipment or lighting systems with electronic ballasts. Type B RCCBs are sensitive to AC, pulsating AC and steady DC leakage currents. This type may be required for use in photovoltaic (PV) solar energy installations because the PV panels produce a DC output and some types of fault can result in the leakage of DC currents to earth. This will however depend upon the inverter used in the installation. Type B+ RCCBs are similar to Type B, but respond to ac leakage currents over a wider frequency range, which is useful in some specialised applications. It’s worth noting that Type B and Type B+ devices can be used wherever a Type AC or Type A device is specified, as they provide the same functionality as these types and more. Type S RCCBs are selective devices intended for use where circuits include more than one RCCB. For example, an installation could include an upstream RCCB to provide protection for several downstream circuits, some of which also have their own RCCB or RCBO. If an earth fault occurs on one of the downstream circuits with an RCCB or RCBO, this device should trip rather than the upstream RCCB. Using a Type S RCCB for the upstream device will provide the necessary selectivity. RCCBs are offered with various sensitivity ratings. In theory, a more sensitive device (that is, one with a lower trip current) will provide more effective protection against the risk of electric shock, but in practice it will also be more prone to “nuisance tripping” – tripping when no significant hazard is present. Guidance on choosing devices with appropriate sensitivity is provided in the IET Wiring Regulations, which should always be consulted. For most domestic and small-scale commercial applications, however, 30 mA devices are used. RCBOs are devices that combine the functions of an MCB and an RCCB in a single device. They therefore provide overload, short-circuit and residual current (earth fault) protection, and are normally used as the only protective device in the circuit. In principle, it would be possible to produce a huge range of RCBOs with different combinations of MCB and RCCB characteristics. In practice, manufacturers limit themselves to the most commonly needed combinations. These typically include a Type B or Type C MCB characteristic, combined with either a Type AC or Type A RCCB characteristic. Where other combinations are needed, it usually means that an RCBO can’t be used and the necessary protection must be provided by using a separate MCB and RCCB. It is worth noting, however, that field-fittable residual current pods are still available, which can be used to convert some older MCB’s into RCBO’s thus allowing the simple upgrade of existing installations. A recent development worthy of note is the introduction of so-called compact RCBOs. 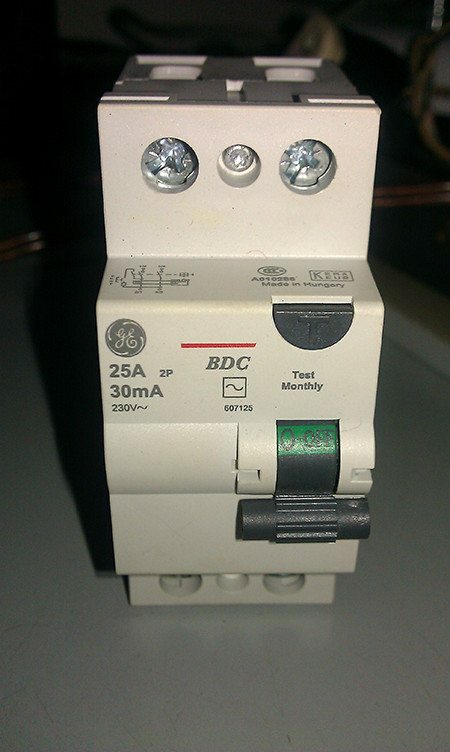 In the past, RCBOs were invariably larger, usually much taller than ordinary MCBs. This meant that they took up more space in consumer units and distribution boards, making it more difficult to wire. The new compact RCBOs are not much larger than an ordinary MCB and therefore make the installation process a lot easier. Compact RCBOs are available with the same combinations of characteristics as standard RCBOs. The current rating, breaking capacity and residual current sensitivity of RCBOs are chosen in exactly the same way as they are for separate MCBs and RCCBs. Look I have been into your site reading about RCCB and I found confusing that in different pages your wrote differently about RCCB. on another page it is written RCBO = overload + leakage protection only. RCBO = overload + leakage protection only. Please clarify and please state places whereby RCBO and RCCB are recommended.